We think brands struggle to stand out not because the media landscape is too busy, but because their work is too bland. When done correctly, branded content can create a new way for brands to engage audiences. 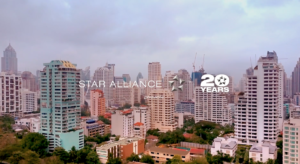 A recent campaign for Star Alliance encouraged people to spend 8 minutes with the brand instead of just 8 seconds. Not by banging people over the head with a message, but by treating content like a book that’s hard to put down. Star Alliance partnered with a Digital Nomad Robert Reed from National Geographic, and challenged him to have 5 unique cultural experiences that would really put him to the test and keeping the audience in suspense about whether he would go through with it. So how can you create content for your brand that captures people’s attention and gets them craving for more? Well it all starts with storytelling. Stories captivate us. It’s the way we are wired, and your customers are no different. Their brains become more active when they hear a story and they can identify and empathize with it. Firstly, we all know the difference between a good film and a bad one, look how Netflix keep us hooked and wanting more with a cliff-hanger at the end of each episode. Well it’s no different for creating branded content for your brand. People want characters that they can relate to. They want a simple plot that they can follow and they want a great ending. Storytelling can create so many different feelings. From inspiring people with human endeavour, (like Red Bull Stratos) creating suspense, making people fall in love, or simply making people laugh. There are so many ways to create an emotional connection with your audience. You should always start by thinking about your audience and what they are interested in, instead of starting with your product. Great stories will get shared and passed on if they are seeded in the right places. In the case of Atomic’s ‘Connecting Cultures’ series, it was designed for in-flight entertainment as well as featuring in National Geographic channels, where Star Alliance’s audience already enjoy spending time. So next time when planning your branded content campaign, think about how, where, and in which channel your audience will be exposed to your story. Before starting Atomic, Guy was Group CD at DDB London, Executive CD at RMG Connect, JWT London’s digital agency and a CD at Saatchi & Saatchi X, creating award-winning integrated campaigns for Volkswagen, Virgin Media, HSBC, Tourism Australia and Vodafone. Are some brands taking consumer centricity too far?